Touring Namibia in a sedan is definitely possible, but it has its challenges. No way!’ exclaimed the farmer as we filled up our tank at Keetmanshoop. Intrigued by the sight of two women in a natty sports car, he’d inquired as to where we were going. ‘You’ll never get to the Quiver Tree Forest or Giant’s Playground in that vehicle,’ he insisted. ‘And there are no tow trucks; so, if you get stuck, you’re in trouble.’ The wheels of his station wagon stood as tall as the windows of our BMW convertible. He rolled his eyes as he inspected its ground clearance. ‘Stupid women’, I could almost hear him thinking. The gauntlet was thrown. Roof down, the Z3 cruised up the wide, compact gravel road as we kept our eyes peeled for the rim-crunching potholes and sump-puncturing rocks that, after the grim warning, we were expecting to find. In fact, it was a breeze; better, in fact, than any gravel road I’d driven in South Africa. Besides, a couple of days earlier, we’d coaxed the low-slung Beemer along the appallingly rough track that follows the north rim of the Fish River Canyon, on occasion having to stop to remove head-sized rocks we couldn’t drive over or around. We were now on the final leg of a three-week tour of southern Namibia. Sure, the rocky roads of the Namib-Rand and Namib-Naukluft National Park and the deep sand at Spitzkoppe had slowed us to a crawl, but we’d survived without so much as a punctured tyre or a chipped windscreen. So, as we headed towards home, we certainly weren’t going to be freaked out by a stretch of compact gravel road. Pah! That was three years ago. This year, we’d decided to tour northern Namibia.Work commitments meant we had to go during the rainy season, which upped the stakes a little bit. But both Namibia Tourism and Avis, which kindly supplied us with our rental VW Polo, assured us that, since most of the driving was on tarred roads, we’d be fine. Jockel and Monica Grüttemeyer, the owners of the Central Guesthouse Swakopmund, our first overnight stop, thought otherwise. 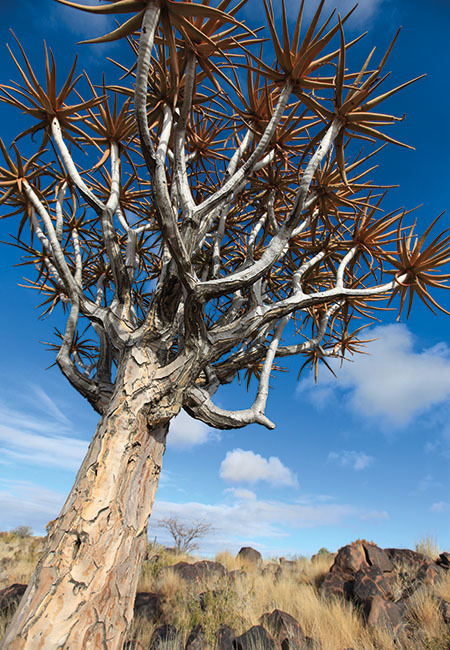 Experienced safari tour operators, they were horrified at our plan to drive up the Skeleton Coast, then through Kaokoland to Sesfontein the following day and still have time for a guided excursion into the Hoanib River gorge. ‘One, but we have tyre weld,’ we assured him. As we headed up the coast road before dawn, we were soon intimidated by the ferocious pace set by the fishermen en route to the sea and the great clouds of dust and stones that accompanied each speedy overtake. ‘Thank goodness we took out extra insurance for the wind screen,’ I muttered more than once. But it turned out to be a fantastic drive, past rugged cliffs, frayed, ancient welwitschias and pronking springboks. And we were fortunate. It had rained a few days earlier and the grader had just been through, so the road was in good nick. We made it to Sesfontein not only in one piece, but in time to enjoy the safari and sightings of desert elephants. Encouraged by the previous day’s progress, we continued north on the C43 gravel road to Opuwo, famous for its Himba people. The trip should have taken us less than three hours, but the Joubert Pass was a muddy morass that taxed Shaen’s well-honed off-road skills. 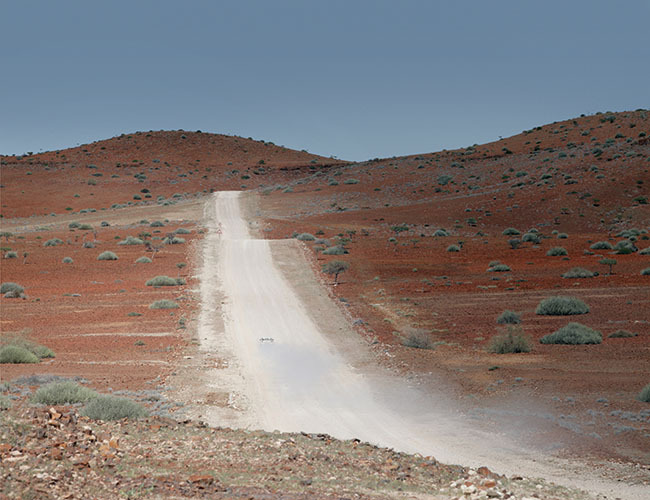 Having spent two years documenting the Australian outback, she, thankfully, is Queen of the Dirt Road. Worse was to come. We had watched the lightning the night before with some dread and, sure enough, it wasn’t long before we came across a river in flood. I wandered in to check the depth. Within seconds, the water was splashing against my thighs. Maybe not. 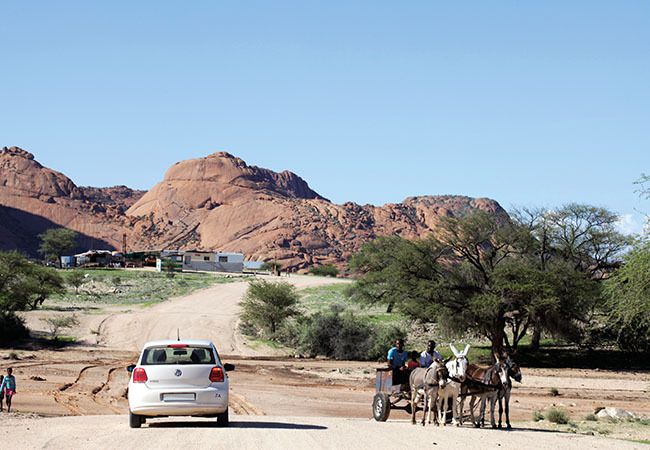 Although the C43 is the main road north through the Kunene region, you certainly wouldn’t call it a highway – in fact, it isn’t even marked on Namibia Tourism’s Adventure Map. It was an hour before another vehicle came along – a bakkie fully laden with people and animals. The driver decided to brave the swirling currents; but, about halfway across, the vehicle broke down, the engine flooded and he and his four passengers leapt out as the wheels began to slide. We jumped in to help: it took all seven of us to push them out. A few hours later, the driver of a furniture truck took pity on us and attached a tow rope to our VW. Just in case. We didn’t need it. Shaen confidently drove through, the water still deeper than the wheels, but it was a relief to know that help was at hand! From Opuwo, we headed east and on to tarred road. Not that this was much of an improvement; instead of rocks, we were now dodging donkeys, goats, horses, dogs, axle-bending potholes, taxis and inebriated locals staggering out of the ubiquitous shebeens as we navigated our way through the more populous regions of Namibia. Here, the speed limit is 120 km/h, but it would have been suicidal to drive that fast. I kid you not, there was an obstacle every 500m. Exhausted, I longed to be back on the empty gravel roads. Once in the Kavango and Zambezi regions (previously called the Caprivi Strip), wildlife was the biggest concern. Traffic sped along the Trans-Caprivi Highway, the long road that bisects the Bwabwata National Park, the drivers ignoring the 80 km/h speed limit and signposts warning of elephants. To our amazement, we spotted a herd of at least 60 tuskers in the trees less than 20m from the verge. Less of a surprise was a crumpled taxi that had struck a hippo the previous night and what remained of a car that had apparently collided with an elephant. On our return journey, we stopped off at the funky Ngepi Camp on the banks of the Kavango River. Deep puddles potted the long sandy road to the campsite, but tongue-in cheek signs reassured drivers that they would not get stuck. The final sign summed up the trip perfectly: ‘All drivers of 4×4s engage 4WD, select low range, lock all hubs and diff, cross your fingers’. The notice continued: ‘Everyone else just drive normally. Don’t worry, 4WD is not needed, but it helps them justify the cost of buying or hiring one’. The reality is that, if you drive slowly and carefully, you can negotiate most Namibian roads, except after rain. Still, a 4×4 will definitely be kinder on you. 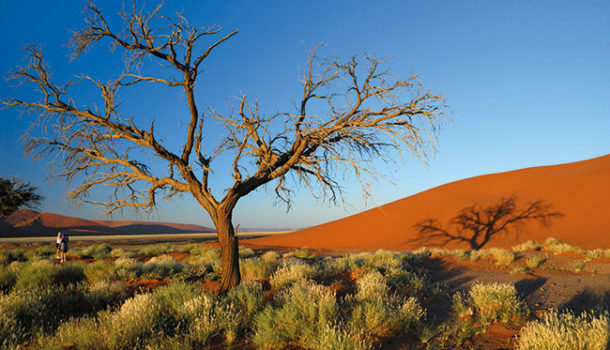 For advice on driving conditions and routes, contact Namibia Tourism. The Namibian dollar (NAD) is pegged to the South African rand. Both currencies can be used freely in Namibia. 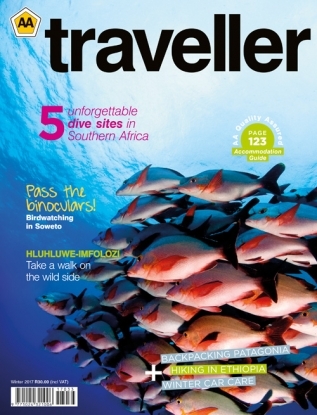 Visas are not required by tourists travelling on SA passports. 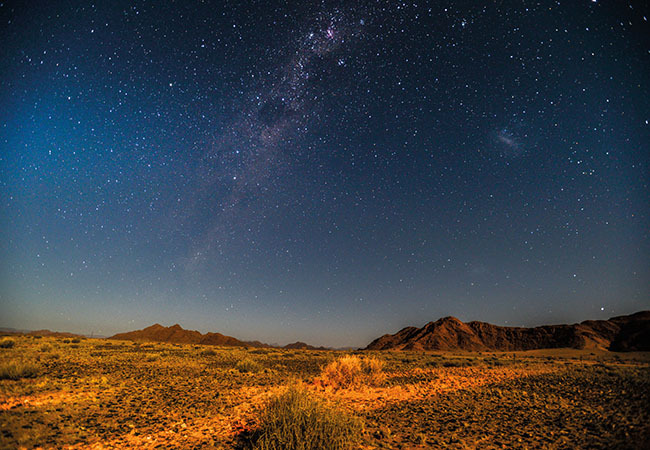 Namibia Standard Time is one hour ahead of Greenwich Mean Time (GMT+1) during the winter months (from the first Sunday in April until the first Sunday in September). So if you’re driving from SA during the winter, you’ll need to put your watch back an hour. For the rest of the year, it’s two hours ahead of GMT (the same as SA). Although temperatures vary from region to region, in general, days are hot and nights can be surprisingly cool. The rainy season lasts from October to April. The coastal strip is cool with low rainfall, but fog prevails from late afternoon until the mid-morning. Pack lightweight cotton fabrics for daytime, but bring a jacket for evenings and mornings. No vaccinations are required (unless you’re coming from a yellow-fever area, in which case you will need a certificate). 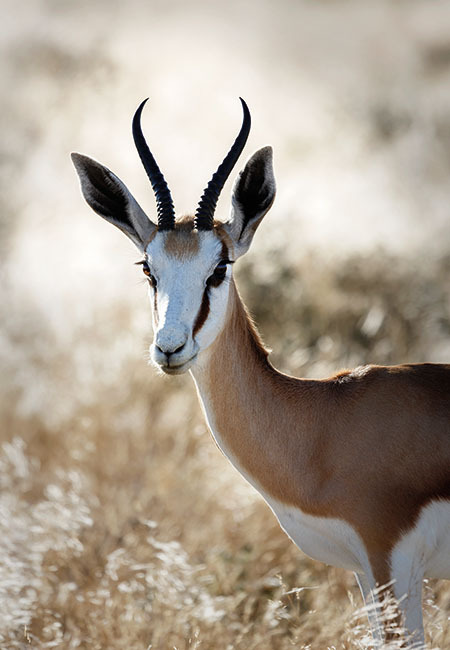 Northern Namibia is a malaria area year-round, and Etosha National Park and the Kaokoveld are considered medium malaria risk in the wet season (November to April), so consult a doctor before travelling to those regions.